Oh, and the fiddle in the image above? It’s an 18th century Guadagnini. It’s worth $600,000.00. I know, right?! 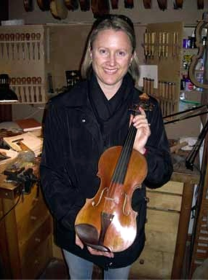 It was fun to cradle (courtesy of luthier Claude Lebet and his Rome violin shop). Interested in where to buy strings for the violin? Take a look at http://www.violin-strings.com, or check out Shar Music, for more general violin-related supplies, at http://www.sharmusic.com.